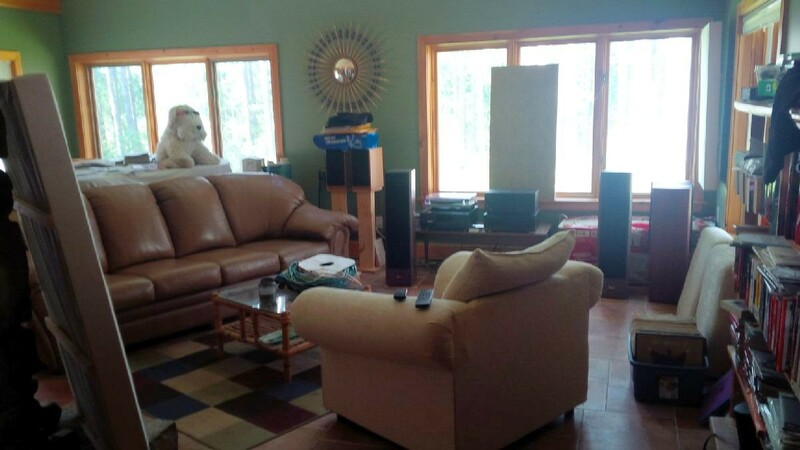 Forums » General Discussion » Hearing Things » Is that one'a them Audiophile couches ? #414039 - 08/12/15 02:55 AM Is that one'a them Audiophile couches ? OK, so I've had a pair of M60v4's and a pair of Sierra 1's in my living room for the last few months, switching somewhat randomly back and forth. It was really hard to choose which one I preferred, or even to describe how they sounded different, particularly since I was comparing bookshelf speakers on stands (which I usually prefer) to floorstanders. The Axioms sounded more "open", plus bigger soundstage in at least 2 dimensions (although some of that might have been size of driver array) while the Sierras sounded "tighter" and more controlled on busy passages with a lot of instruments happening at once. Tough call. My brother-in-law was redecorating his living room and the "big ol comfortable couch" was no longer welcome. So we hauled it up to my living room and hauled my ratty old couch/loveseat out to the firepit. I took the big foam cushions off the old furniture and leaned them up against the living room wall while I figured out what to do with them. Thought I was listening to the Sierras, and had to walk around behind the speakers to confirm which ones had cables coming out the back. I regret to admit that my first thought was "maybe there is something to this break-in thing after all" but then I realized that I had inadvertently changed the room acoustics by adding a big pile of damping and probably a bit of bass trapping. Imaging seems to have lost something, so more work required, but the improvement in "tightness" of the sound is frankly amazing. The room might be a bit overdamped now but the "blurring together" I had been hearing on busy passages and attributing to the M60s (I figured maybe a bit of cabinet resonance) was gone. I didn't think a room change could make that kind of difference. I'm not going to think about it for a while because I could lose another week experimenting and I have too much real work to do. But it's good. EDIT - it occurs to me that one of the reasons I have always leaned towards bookshelf speakers on stands for music is that "tighter" sound they seem to have. I always assumed that was a function of smaller & hence more rigid enclosures, plus the fact that putting heavy damping goop on the inside of a small cabinet was a lot more practical than doing it on a floorstander. Wondering if some of the difference has been the bigger speakers energizing the room differently so room echo/reverb was having more effect ? It doesn't seem likely at first glance but either the speakers *did* undergo a dramatic change in sound or changing the furniture and leaving a lot of foam cushions lying around really changed the sound in a way that I thought was only a function of speaker not room. It's like, heartwarming-audio-story week here! We should do this every year! Thanks for taking the time to write it, at 3 a.m., you crazy person. Yeah, I was working until about 2pm and couldn't get to sleep after that, so I put on some music and the rest is history. I wonder if there are annual awards for ugliest but functional listening room ? Not really "doubts", more of a long-standing preference for full-range 2-way speakers on stands without ever really knowing why. They always seem to have a tighter sound than comparable (ie same model / same build quality / higher price) floorstanders. Always assumed it was some physical characteristic of the speakers but now I'm not so sure. It would have been a much easier comparison if I had been able to compare the Sierras with a pair of M3's rather than the M60s. Anyways, when I get back in a couple of weeks first step will be to see if the tighter sound in the "new" room is just a bass thing or at all frequencies. Will also have to see how the extra damping affects the Sierras and the M40s. OK, so I might have missed the Axiom 35th celebration because I was STOOPID but it didn't mean an Axiom-free weekend. Might have been some subconscious thing (in which case I had better pay more attention to subconscious things in the future) but I did get a chance to do a bit more experimentation with speaker placement and treatments. Turns out the ex-sofa cushions leaning against the wall on the right (behind the tub of LPs) really do help -- maybe doing a bit of bass trapping as well as adding some absorbtion near the big side window you can't see. Discovered that totally by accident, just needed somewhere to lean the cushions after the sofa itself was sacrificed to the bonfire. On the other hand the acoustic panel which used to hang on the right wall just this side of the window seems to work much better leaning up against the fireplace on the left. The room seemed a bit unbalanced before moving the panel -- too "dead" on the right -- but moving the panel seems to help. The fireplace (technically a masonry heater) is covered with a mixture of river rocks and Arriscraft fake rock. In order to stop obsessing about it, I have convinced myself that it adds some much-needed diffusion to the room. The white-ish chair in the middle of the picture is the last survivor of the old furniture and is sufficiently comfortable to keep around, but I'm thinking about replacing it with a swivel recliner (or at least some kind of swivel chair) so I can either face the speakers or face the sofa depending on whether I'm listening or being sociable. The fiberglass panels leaning up against the front window, side window and opposite walls still seem to be required, so at some point I'm going to have to wrap them in wood/fabric or something to make them less ugly. Not sure what to do about the whole "leaning up against the middle of the window" thing though, other than maybe covering the window completely with cellular shades and hoping that works. I guess someone probably makes vertical blinds where the individual strips are made of OC703, but I haven't found them yet. And yes, I just noticed there are 3D glasses on the stuffed dog. My sister was here for few days. The question is why I didn't notice them when I was working and listening in the room but immediately noticed them after I posted the photo. Bridge, baby, you can't possibly have a wife! All that gear in one room would make an imaginary wife's head explode! Would it have been funnier if I had said, "... a party doll's head...?" I can't imagine not having windows in a listening room. Yours looks very easy to listen in for hours. Lot of stuff to echo bust for you in there. I just have to ask, will the room acoustics change if the stuffed dog is removed? Probably... that's my excuse for not tidying up yet.